(Jacksonville, Fla.; July 20, 2010) — Crowley Maritime Corporation’s vessel construction boom is continuing unabated with its recent order of two additional high-bollard-pull Ocean class tugboats from Bollinger Shipyards. 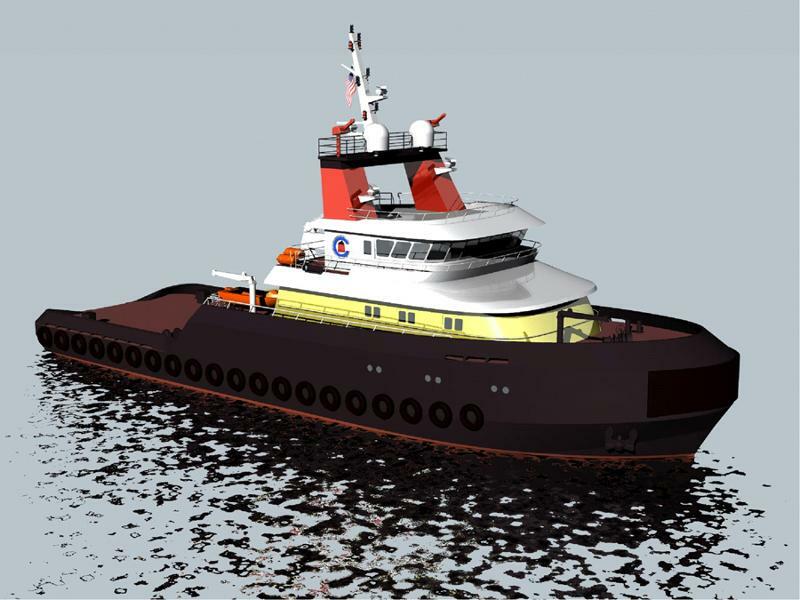 The latest contract brings the number of new 10,880-horsepower tugs being constructed for Crowley to four, and adds to the more than $1 billion the company is investing in new tugs, high-capacity barges and articulated tug barge tank vessels (ATBs). The new tugs, Ocean Sun and Ocean Sky, will join the Ocean Wave and Ocean Wind in the Crowley fleet over the next two-and-a-half years, and further solidify the company’s standing as an industry leader in ocean towing, salvage and offshore marine support for the upstream energy industry. Ideally suited to work with Crowley’s new 455 series high deck strength barges, which measure 400 feet by 105 feet (121.92 meters by 32 meters) and offer increased stability for loads up to 4,200 pounds per square foot (1,905 kilograms per 0.09 meter), these Ocean class tugs will be outfitted for long-range, high-capacity, ocean towing, rig moves, platform and floating production, storage and offloading (FPSO) unit tows, emergency response and firefighting. They will be constructed at Bollinger Marine Fabricators, LLC, in Amelia, La., with all four vessels scheduled for delivery in 2011 and 2012. These next generation towing vessels will be outfitted with twin-screw, controllable-pitch propellers in nozzles and high lift rudders for a combination of performance and fuel economy. The tugs also feature dynamic positioning technology (DP-1), which allows the vessel to maintain its positioning and heading automatically using a centralized manual control that continuously calculates environmental conditions and adjusts to the dynamics. The Caterpillar-supplied main engines and generators are all EPA Tier II compliant, and have the ability to be upgraded to meet future environmental standards, for cleaner emissions and a lower environmental impact. Further environmental protection is provided by the tugs’ double-hulls, which are designed to prevent any overboard discharges of fuel or fluids. All tanks containing liquids are inboard of the side shell. Safety is of paramount importance to Crowley and the newly designed tugs will feature waterfall style winches, shark jaws and retractable pins that can all be controlled from the pilothouse, keeping the deck clear of personnel and reducing the risk of accidents. The tug design also features ergonomic accommodations and comforts proven to minimize fatigue and reduce injuries. Crowley subsidiary Jensen Maritime Consultants assisted Crowley’s Ed Schlueter, vice president, vessel management, and a cross-functional team in the design of this new class of vessel. The boats will also hold Green Passports, which inventory materials present in a vessel’s structure, systems and equipment that may be hazardous to health or the environment. The Green Passport is regularly updated and maintained and is eventually passed by the owner to the vessel recycling yard at the end of the ship’s life, to enable the yard to formulate a safe and environmentally sound way of breaking the vessel. The tugs will meet all SOLAS (Safety of Life at Sea) and ABS criteria, and including ABS Fi-Fi 1 firefighting standards, and will have the capability to support salvage and rescue towing opportunities, as well as the U.S. Navy’s SUPSALV Contract. For more information about Bollinger Shipyards visit, www.bollingershipyards.com.